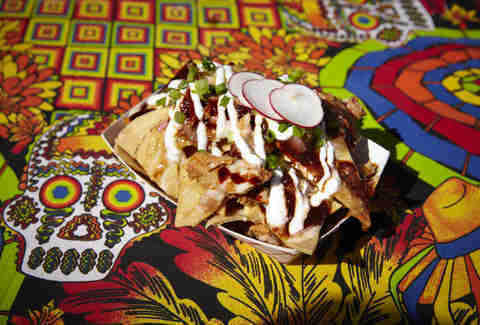 Just when you thought this summer's lineup of outdoor food markets couldn't get any better, Brooklyn Flea announced Friday that its beloved Brooklyn-based chow down fest, Smorgasburg, is soon expanding to Queens -- promising the borough's best "exotic/ethnic/exciting" foods like Thai noodles, Colombian arepas, Filipino pancit palabok, and more. Slated to open Saturdays starting July 11th, the brand new market will be located at 43-29 Crescent St. in Long Island City, a 7,500sqft outdoor space connected to a 10,000sqft indoor building that was previously used for art displays and music. Smorgasburg tells us they're expecting to open with about 30 vendors, several of which are already confirmed, and that they are now accepting applications from additional Queens-based establishments. 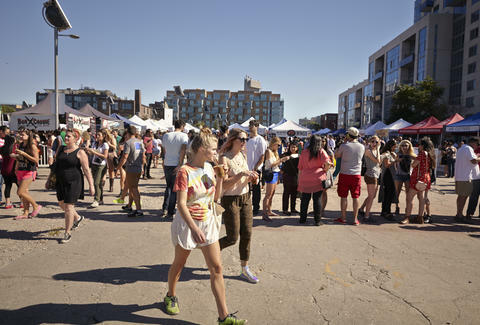 The announcement comes just a week after Brooklyn Flea announced plans to bring a smaller version of Smorgasburg to Coney Island, which is set to open as soon as May 22nd. "[Expanding to Queens] is something we have been thinking about in various ways for a while now," said Brooklyn Flea co-founder Eric Demby. "If you could go to Smorgasburg and get the best Indian food from Jackson Heights and try the best Filipino food from Woodside -- even just a few of these places -- it would be a really cool thing. Not only would it be something people from Queens would love because it celebrates the food from the borough, but it’s also something people from all over New York would enjoy too." Papa’s Kitchen: Filipino fare, located in Woodside. Plant Love House: Thai noodles and desserts, based in Elmhurst. Arepa Lady: Previously a famous food cart, it's now a small Jackson Heights spot. La Esquina del Camaron: They'll be serving up some Mexican seafood cocktails. Outer Borough: A Brooklyn Smorgasburg veteran, they're bringing their Taiwanese beef scallion pancake rolls to the new Queens market. Bun-Ker Vietnamese: Their website slogan is "Good Pho-king Vietnamese Food" -- pretty much all you need to know. Pata Paplean: A popular, funky Thai bar in Elmhurst becoming known for its amazing noodle soup. Smorgasburg Queens will be open from 11am to 6pm, which actually lines up perfectly with the start time of the Queens International Night Market, a brand new food market featuring an eclectic mix of international street foods at the New York Hall of Science parking lot in Queens. Basically, expect to be spending way more time in Queens this summer. Smorgasburg's Brooklyn locations at East River State Park (Saturdays) and Brooklyn Bridge Park Pier 5 (Sundays) returned for the 2015 season in early April, bringing along a bunch of brand new food vendors. Tony Merevick is Cities News Editor at Thrillist and will add this to his summer chow down plans. Send news tips to news@thrillist.com and follow him on Twitter @tonymerevick.